So you want to be a writer. It is your dream job, you feel that it is your destined vocation, you are in love with words and the process of putting them together fascinates you like no other thing. But before you get to achieving this dream, read this article and ask yourself: “Do I really want it?” Because professional writing is not all fun and games. It is, probably, as far from fun and games as it is possible. The law of supply and demand works against you. Just like with any other creative job, the writers are far more numerous than writer jobs with decent pay. A lot of people dream of becoming writers, just like you – and the truth is, the majority of them will never see their dream fulfilled. Some lack talent, some lack determination, and some fall victims to supply and demand. Perhaps they are good writers, but there are a lot of other writers that are just as good. In order to get ahead of the crowd you should be better than the majority of it – and a little luck won’t hurt either. Some people think that writing means putting on paper something that magically appears in your head. It is not true – before something appears in your head, you should put it there. Read, do research, get experience in different fields. 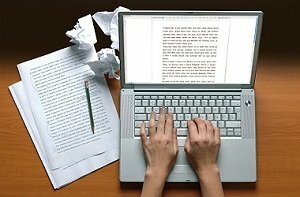 In general, you will spend much more time preparing to write than actually write. Do You Really Have a Talent? You should have a talent – you cannot simply take a course in creative writing and expect to learn how to write. Some people are just not cut out for it – and you will do yourself a world of good if you find out that you are one of them early enough. It will save you a lot of time, pain and frustration. You see, it is not enough to be able to put words together and have ideas what to write about. You should understand the inner workings of these words, you should know how to create atmosphere, how to control pacing and, most importantly, how to get your message to the reader. Some aspiring writers try to turn the incomprehensibility of their works into an advantage, saying that those who don’t understand them are not intelligent enough. It is a lie; if you can’t get your message through, it is mostly your fault. Just like any other creative work, writing is far from being a regular job – at least for the majority of people. You cannot go to an employer and simply apply for a position – you have to work your way up on your own. It will probably take years of toil, determination and disappointments before you actually get any results – and there is no guarantee that these results will be forthcoming at all. Take it all into account; if you still think that it is your cup of tea, then good luck! Posted in Advice for Writers, Discussion Topics, Interesting Stories.